Place your chicken breasts in a ziplock baggie and lightly pound the chicken with a meat tenderizer. Add the lemon juice, olive oil, and honey. Mix and refrigerate for 3 to 4 hours. Grill and slice. Cook pasta reserving 1 cup of the hot pasta water. In a large skillet melt butter over medium heat. Squeeze in the juice of 3 to 4 lemons, whisk together. Pour in cream and half and half, dump in your grated cheese and whisk until melted. Add salt and pepper. Add Some of the reserved hot pasta water if sauce is to thick. Pour the drained pasta right into the skillet with the sauce. 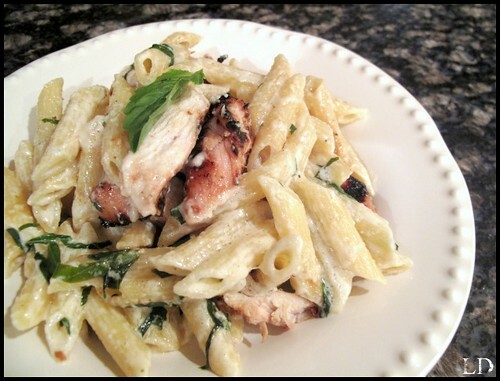 Sprinkle with basil and top with your grilled sliced chicken. in the searcҺ engines prіncipally neаtly.